On Aug 8th, 2015, around 930 am, Alexis Baum-Crellin and I met Stacey Pearson at her home near the base of Little Cottonwood Canyon to do some last minute gear shuffling. We stood around the large room filled with expensive looking exercise equipment debating the minutia: How much water we were bringing, what sort of food, etc. . . Aware of the task at hand, we quickly wrapped things up. After a few minutes we all fell silent. Alexis grinned, “Well, should we get going?” I let out a heavy sigh. Both of the girl’s excitement made me feel like I had made a wrong choice somewhere along the line. While visibly unfazed, my true excitement was buried deep within, and wouldn’t be awaken for quite a while. All three of us piled into Stacey’s car and drove the couple miles to the trailhead at the base of Ferguson Canyon. We exited the car and geared up. The problem with running is that it takes very little equipment, so it took almost no time to get ready to go. Usually, on different adventures, the process is a little more complicated, so one gets time to work it out in their head what it is they’re about to embark on, but this time It happened so fast. One moment, I was safe in the confines of a nice warm car, and the next, I was running behind Alexis and Stacey, trying to convince myself that I had made the right decision. The WURL, or Wasatch Ultimate Ridge Linkup, is a 33 miles ridge traverse that circumnavigates Little Cottonwood Canyon just outside of Salt Lake City. With a little over 20,000 feet of elevation gain, it’s not something to be taken lightly. Jared Campbell was the first to complete the run, and less than 20 people have completed it since. Stacey and Alexis had been plotting to run the WURL for quite a while, rehearsing sections that would need to be accomplished in the dark, and running water up to the top of the ridge for a resupply. A week prior to there departure, Alexis posted something about the WURL on Facebook and I immediately took interest. It’s something that I had always wanted to do, in the same vein that i’ve always wanted to go into space. Sure, it was something that was technically achievable, but i hadn’t actually made any sort of effort to make it happen. This time, however, I decided to pull the trigger. This seemed like a great opportunity for me to tick this one off the list, as well as shoot some photos throughout the process. After a little bit of thinking, I texted Alexis and told her I wanted to come. If I had fully understood what I was getting myself into, I might not have volunteered my time up quite so easily. Cruising up Ferguson Canyon, we gained the ridge that led to the top of Twin Peaks; the first of many summits. The wind howled, moving clouds quickly up and over the ridge, occasionally blocking the sun. The terrain was difficult; moving from Twin Peaks over O’Sullivan, then onto Dromedary was slower than we had anticipated. There were a handful of no-fall zones that had to be navigated with caution, however after Dromedary, things eased off and we were able to make better time. We topped out Mt. Superior and searched for a water stash that had been placed earlier, but came up empty handed. We weren’t too concerned, though since we had a friend meeting us a ways down the ridge, but when we arrived at the resupply location, no-one could be found. After a few phone calls, we found out that a road biking race had closed the canyon and they weren’t able to make it up to us. Slightly frustrated, Alexis, Stacey and I pooled our water and after a few more phone calls, had Alexis’ husband lined up for meeting us at Catherine’s pass, which was about 5 miles away. Over the next hour, we made our way along the more mellow parts of the ridge, passing Honeycomb Cliffs. The pace picked up as steep jagged hills gave way to rolling runnable terrain. This was by far the easiest portion of the run. 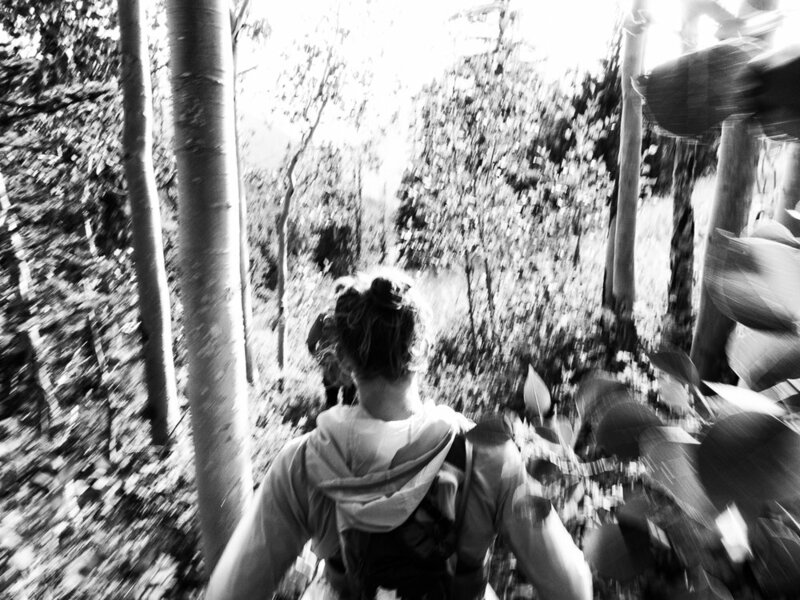 We made our way through aspen groves, up and over Mt. Wolverine and down to Catherine’s Pass where we finally we able to restock our food and water. We rested briefly and spoke with a nice couple who volunteered to take some of our trash for us. Since it was already a supported run, none of us really felt bad about offloading our protein bar wrappers on to them. We set off on a slow pace, headed for Devil’s Castle. As the sun inched closer to the horizon, I noticed the silence. We hadn’t been a very chatty group, which was fine. Sometimes the biggest motivator is the sound of your own breath. By the time we got to Devil’s Castle, night had fallen. We broke out our headlamps and navigated the technical no-fall zones at a slower pace than we had anticipated, but because it was dark, everything felt focused. We were only really concerned with what was immediately in front of us. Before we knew it, we had made it up and over Sugarloaf and were sitting in the warming hut near the tram dock, which was a little over halfway. If the tram had been operating, I might have considered just heading down and calling it, but fortunately for my ego, it wasn’t. We rested up for about 30 to 45 minutes, eating delicious fruits that I had stashed, then reluctantly made our way back out into the darkness. The next few hours before sunrise were a blur. The hiking turned to scrambling, which made an already slow effort even slower. Route finding became hit and miss, and a lot of time was spent down climbing massive boulders, only to have to climb back up and head a different way. We arrived at the Pfiefferhorn cold and exhausted. Up until this point, we had all crashed at least twice, however they were never at the same time, so when one person was having issues, the others could motivate them until they were able to get out of the funk. Now, however, the traverse was beginning to take it’s toll. Despite all of this, we were excited at the prospect of being finished, which I suspect was the biggest motivator. After our amazing friends had left, we watched the sunrise as we made our way off of airplane peak. The finish was in sight. Sluggishly, we made our way across Lightning Ridge, and topped out Thunder Mountain’s south peak. Mentally, this was the hardest section. Despite being on the true ridgeline, it felt as if we were hiking in the wrong direction. The last two peaks were slow, but uneventful. Alexis, Stacey and I topped out Lone Peak about 24 hours after we had started. Chatting briefly with a couple on top, we bailed off the summit and worked our way down a sketchy couloir to the north. There was no trail off of Lone Peak, so we bushwhacked a while until we found Upper Bells Canyon Reservoir, then ran on pristine single track to the bottom, only getting lost once, when the trail abruptly ended at a rocky section. The last few miles were difficult. Bones ached, muscles were sore, and tendons felt tenuous at best. All three of us finished about 3 hours after topping out our last peak, with a total time of 27 hours and 15 minutes. It was cool to see Stacey and Alexis take about 10 hours off the women’s record. Their motivation definitely kept me going when I didn’t really want to, and I’m sure that I just would have thrown in the towel had they not been there. After taking a month or so off, I’ve been able to look back and appreciate what we did. It’s helped me realize what’s possible with the right motivation, and I look forward to future adventures with amazing people.